No Waiting Period, Get New Teeth Immediately! 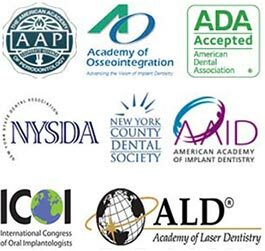 Dr. Navid Rahmani is a leading dental implant specialist, dental implants New York expert and one of few implant dentists in NYC to offer newest and most advanced dental implant techniques for placing single or multiple dental implants in NYC. Dr. Our best rated dental implants center is located in Midtown Manhattan & Upper East Side, NYC. We use only the newest and most advanced dental equipment available on the market in USA. Dental implants are from Straumann, headquartered in Basel, Switzerland. It’s the largest and most advanced dental implant company in the world. We use top quality medical grade titanium or titanium alloy, the same materials used for other bone implants and for orthopedic joint replacements. Difference between titanium and zirconia dental implants. Most of the dental implants in NYC are immediately loaded which means a new restoration can be placed on top of the dental implant soon after surgery. This might be the same day as the implant is inserted. With the proper treatment and the right kind of on-going dental maintenance, your dental implants could give you many years of problem free use so it pays to choose your implant dentist in NYC with care. Missing teeth cause one to feel self conscious. Whether it’s one, several or a row of missing teeth, dental implants give you the perfect and confident smile that you deserve! Most dental implant specialists in USA are using either simple or compound loupes mounted on glasses frames. We recognize that quality and precision are very important to produce aesthetically perfect dental implant. Therefore, we are using a high precision microscope that has the potential to enhance a dental implant specialist vision to unprecedented levels. Microscope becomes a standard and a necessary tool in NYC Dental Implants Center for polishing and finishing teeth margins and for contouring teeth and teeth implants. Dental implants are essentially replacement teeth made from medical-grade titanium posts. Our dentist will surgically fuse the post of the dental implants with the bone in your upper or lower jaw. Once the post is implanted, our skilled periodontist will cap the post with a tooth-colored, natural looking dental crown, bridge or denture. Dental implants will help you smile more, chew better and speak more clearly. Candidates for dental implants in NYC must have good general and oral health due to the surgical procedure involved. One needs healthy gum tissue, no periodontal disease and sufficient bone to anchor the post of the dental implant with which will gradually fuse with the bone. Will dental implants be successful? Dental implants have the greatest success rate than any other surgical implant procedure. The success rate is due to the fact that the lightweight titanium posts used in dental implants fuse so easily with the jawbone in a process called osseointegration. Once the procedure is done, there is no worry of the body rejecting the post of the dental implants. In the weeks and months after getting dental implants in our NYC implants center, you will learn to treat them like your natural teeth. Our dentist and periodontist will work closely with you following the procedure to ensure that you maintain the best oral health.